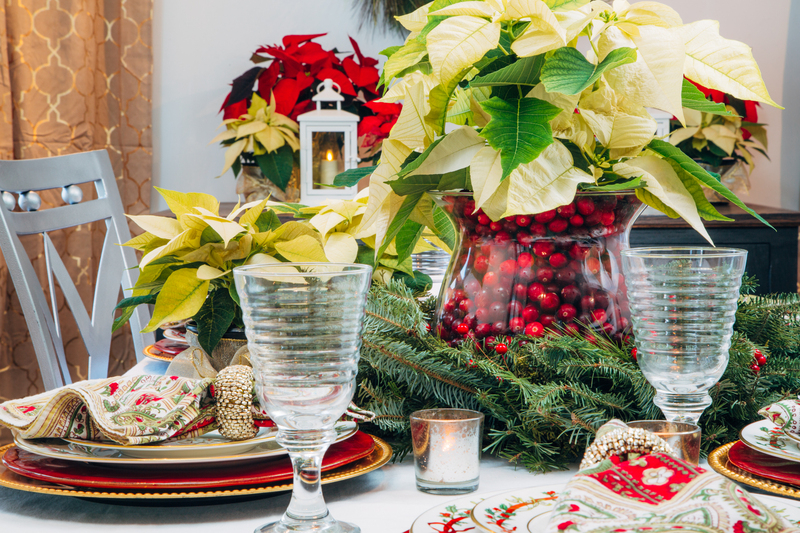 Want to create a gorgeous Christmas tablescape this year? 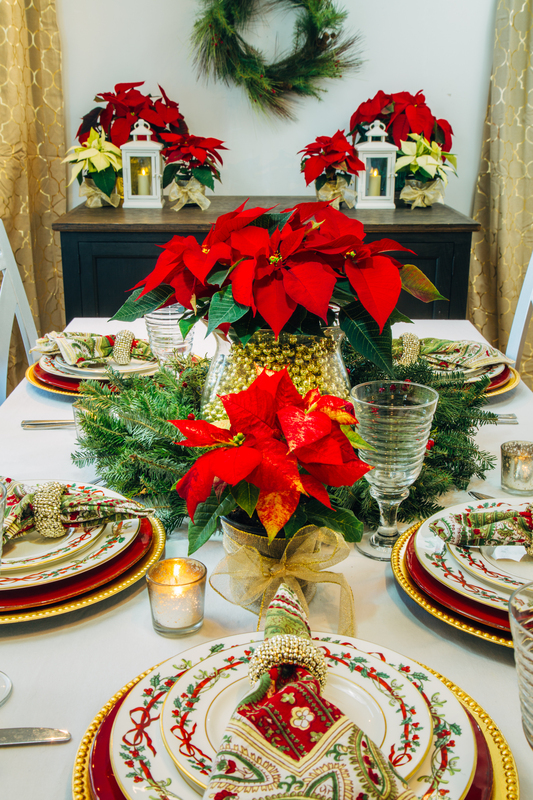 Look no further than everyone’s favorite Christmas flower—the poinsettia. Decorators often overlook fresh poinsettias when assembling a centerpiece, but these festive plants are the perfect highlight for a brilliant holiday dining table. Following a more traditional take on Christmas table décor, we experimented with two different versions of our potted poinsettia centerpiece. With minimal supplies, you can recreate both of our centerpieces and customize them to match your style. For our first arrangement, we placed a 4.5-inch potted red poinsettia in a clear glass vase filled with metallic beads. The small size of the pot allows the vase to be filled with enough beads that the poinsettia appears as if it’s floating on top. Try filling the vase with your favorite color of metallic beads or ornaments for a bright and bold arrangement that will complement any Christmas color scheme. Are you dreaming of a white Christmas? This second centerpiece option is sure to fit your Christmas table. 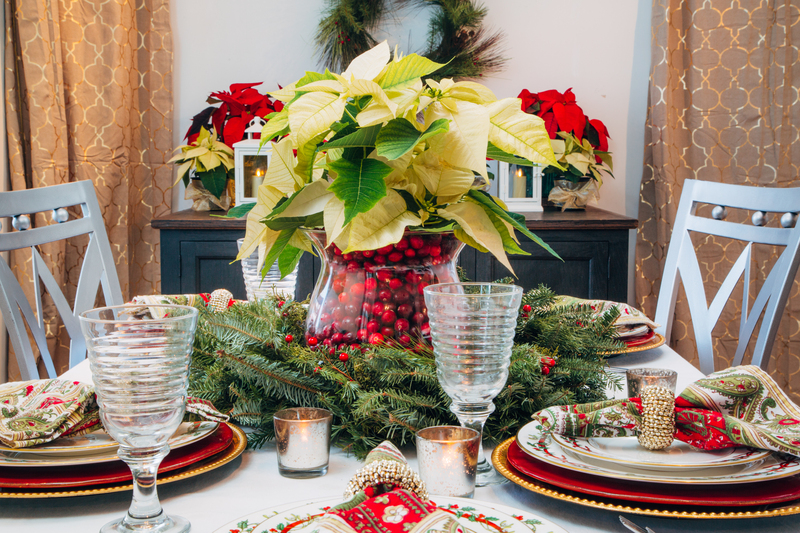 In keeping with the previous centerpiece, our alternate look features a 4.5-inch white potted poinsettia. We set the potted plant inside a glass vase and filled the empty space around the pot with fresh cranberries. Their deep, rich color contrasts beautifully with the velvety white poinsettia blooms. Bring more life and freshness to your table by adding lush greenery around the base of the centerpiece. We used a small wreath where the vase fit perfectly in the center, but the same look can be achieved with a garland or trimmings from your Christmas tree. Whichever arrangement you decide to use, your elegant centerpiece will be sure to stun even the pickiest houseguest. The best part of decorating with potted poinsettias is enjoying them long after the festivities have ended. With proper care, they will continue to bloom well into the New Year. 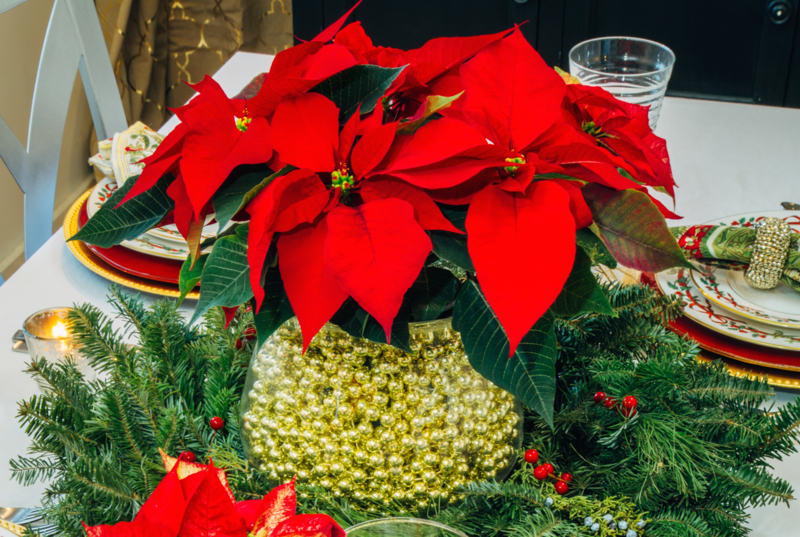 Follow these simple tips to keep your poinsettias vibrant and healthy. Keep your poinsettia indoors and away from cold drafts or extreme heat. Water weekly when the soil feels dry. Avoid overwatering. Remove the leaves as they fade.